Growing out of a literary group that was strongly allied to Dadaism, Surrealism took root in the art world in the 1920s. One of the most widely known art movements, Surrealism is defined by Andre’ Breton as ‘psychic automatism’ in its purest state through which one expresses. What Breton suggests is that artists sidestep rational thought by accessing their unconscious mind and use this to create work, be it written or drawn. We have moved far ahead since the age of surrealism and witnessed many great movements that followed. Nonetheless, upon entering Canvas Gallery on the 25th of April, we are taken back to this mind-blowing era. Greatly accomplished artist, Shakil Saigol, displayed 16 works in a solo show titled, ‘Surrealism Revisited’ at the gallery. Saigol is a self-taught artist and has participated in numerous solo and group exhibitions nationally and internationally. His works are part of various collections in Pakistan as well as India, Britain, USA, Italy, Germany, Switzerland and UAE. A factor that seemed to connect various surrealists was the type of imagery used, namely, Nature. Frequenting a lot of their works, the objects appeared outlandish and arose from their unconscious minds. Well-known examples include: Salvador Dali and his use of eggs and ants while Max Ernst displayed an obsession with birds, made evident by their recurrence in his paintings. It is said that he even had a bird alter ego. 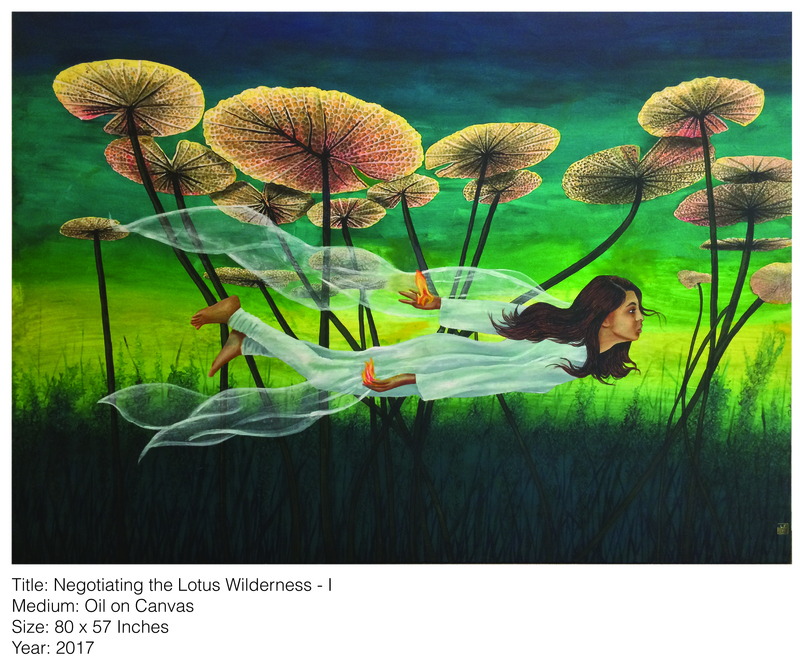 Similarly, Saigol uses recurring motifs in his paintings; lotus pads, leaves and zebras dominate a majority of the works, accompanied by the human form and spider webs. In fact, it seems that organic subjects inspired Saigol a great deal; barring the presence of a few man-made articles like the paint brush and candle, his oeuvre is occupied by the living world transforming the synthetic gallery into a biological jungle. As an artist, Saigol made a conscious decision many years ago to restrict himself to a specific colour palette. Again Nature stimulates his hues as the greens of the leaves, the blues of the sky and the contrasting black and white of the zebra pop out from the paintings. 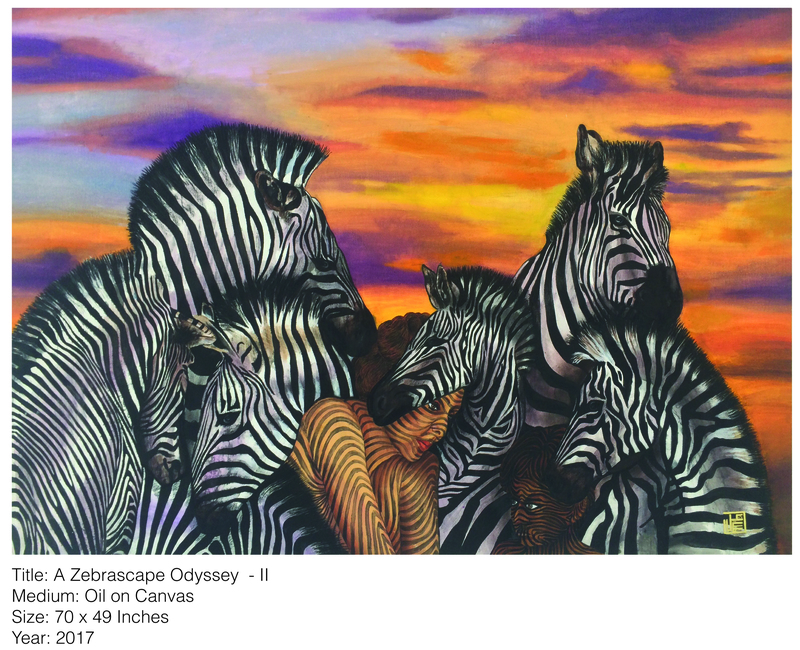 One work that appears to stand out among the rest is ‘Zebra Phantasma I’. 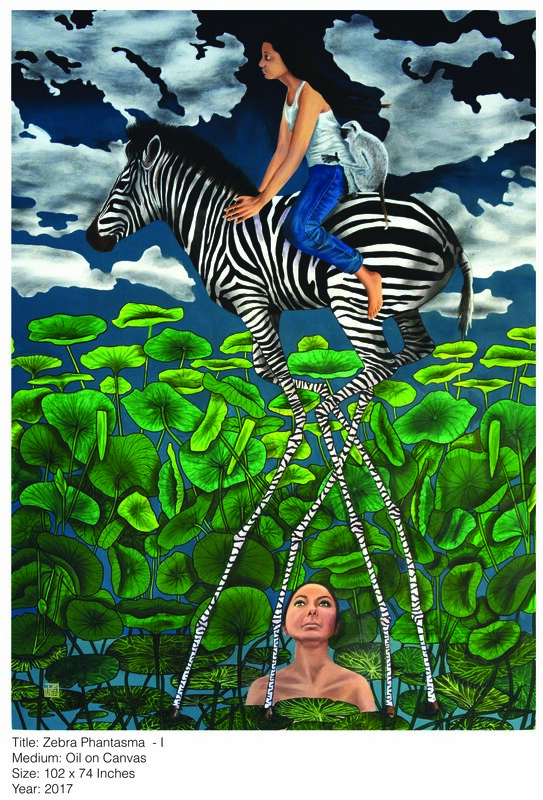 The wall-sized canvas depicts a young girl and her monkey companion riding a zebra whose legs stretch down to the bottom of the canvas, thinning out to resemble the stems of the lotus leaves surrounding it. Under the animal, the bust of another female looks up as they cruise against the dark sky. The whole scene is fantastical; realistic elements merging into each other, capturing the viewer and making the eye move throughout the canvas. This movement is also aided by the intelligent use of shades and tints; the darkest part of the painting resides on the top most part of the canvas, followed by a slightly lighter shade on the bottom thereby giving the centre of the work the most focus and allowing it to jump out at the audience. Saigol has left much of his work to the interpretation of the viewer, relaying only his interest in surrealism, his artistic inspirations and muses in his statement. Therefore, while standing in front of his work, there is a need to draw some conclusion from it and one can’t help but revert to the general symbolism of the entities painted. Biologically, no two zebras have ever been born with the exact same stripe pattern, making each animal unique and therefore a symbol for individuality. It is also seen as a sign of balance and believed to represent the black and white nature of the world. The white lotus flower which grows on the lotus leaves are seen as a symbol of purity as they grow prosperously above muddy waters in which their long stems are rooted. With all this in mind, as one gazes at ‘Zebra Phantasma I’, there are assumptions being stimulated. The young girl, who can easily be identified as Saigol’s muse and granddaughter, is adorned with the colour of the white lotus and like the flower of purity rises up above all other living things. She is a master of individuality and uniqueness as she has gracefully tamed the wild zebra and keeps the company of intelligence which her monkey-partner symbolises. The girl can also be seen as conquering the conflicted world, domesticating its black and white disposition. The older woman below looks to the girl, as if witnessing some kind of dream or memory. Similarly, these presumptions can also be drawn from’ A Zebrascape Odyssey I and II’ where feminine beings intermingle with a herd of zebras. They blend into the zeal, clothed in nothing else but the striped pattern which can be seen as these women embracing the life of balance. The work could also suggest that like the zebra, the female specimen in its rawest form, is quite exceptional.’ Zebra Phantasma II’ can also be understood as an acceptance of balance, this time by the artist himself, who paints a self-portrait here with a giant tree growing out of his head and a zebra seated above. Monkeys hang around the branches, and the whole painting feels like an illustration of the artist’s mind; rare, intelligent and though the portrait is not from his youth, his mind however, is evergreen. Other portraits have been used as well, including another self-portrait with paint brushes, a palette and candle. In the same colours, another canvas, displays the portrait of a woman with batteries embedded in her hand and a candle held behind her. His muses, his granddaughters, also reside in some of the works, such as ‘Negotiating the Lotus Wilderness I and II’. Here the females, clothed in soft white fabric, glide under the lotus pads to, as one can assume from the titles, confer with the wilderness that lurks below. 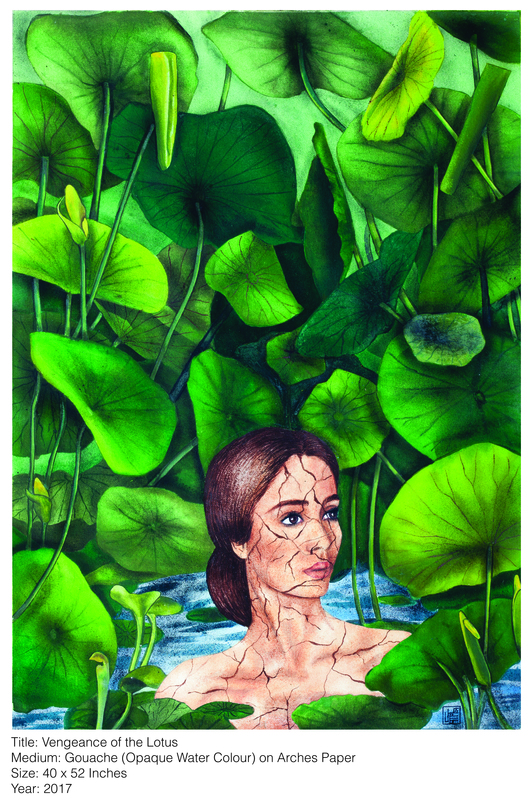 This could be to reach an agreement and prevent another attack by the plant-life that seemed to happen in ‘Vengeance of the Lotus’ where the bust of a woman, concealed in only cracks, floats just above the water, encircled by the flora. 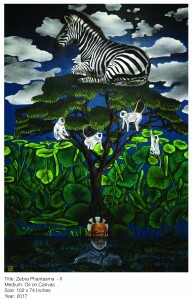 Among his surrealist inspirations, Saigol admits to being greatly influenced by renowned Indian artist, A Ramachandran. Ramachandran began as an expressionist who painted urban life. That all changed after a visit with a tribal community in Rajasthan that expanded his imagination. His work is full of life with strong lines and vivid hues, and many have the lotus pads as repetitive patterns. Saigol’s body of work appears as a somewhat celebration of the Indian artist through the use of parallel imagery and melding of objects. With a focused palette and specific themes, Saigol’s brings his previous fixation with Surrealism to the canvas. His use of normal imagery entwining into each other, creates hallucinogenic scenes that jolt the viewer from their dazed reality.